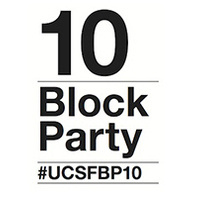 The Mission Bay Block Party celebrates 10 years of building community! The first 2,000 people will receive a lunch voucher sponsored by P.R.I.D.E. The first 300 customers who visit the Pacific Coast Farmers' Association Farmers' Market at Mission Bay will receive a free tote with purchase! There is a chalk art contest with a grand prize of a $500 gift card to Publico/Cafe 24. The UCSF Police Department will bring McGruff the Crime Dog and have a safety fair. There will be assorted vendor booths, a prize wheel and live DJ! Don't miss the party!